(NaturalNews) Officials with the Internal Revenue Service (IRS) have admitted that the agency inappropriately targeted conservative groups seeking legal tax-exemption status in the years and months leading up to the 2012 election. Those same officials have apologized for the targeting, which one of them - Lois Lerner, who was head of the tax agency's division that oversees tax-exempt groups - described as "absolutely incorrect" and "insensitive." Since then, the Obama White House and the IRS both have insisted such targeting ended in May 2012. Since then, however, news has surfaced that the agency, in fact, did not stop targeting conservative and "tea party" groups. According to a pair of Washington, D.C. attorneys - who are representing several such groups in federal court - the IRS has continued to jerk them around for years with foolishly invasive questions and other barriers, all the while sparring liberal and "progressive" groups similar scrutiny. The American Center for Law and Justice, headed by chief counsel Jay Sekulow, plans to file suit in federal court in the coming weeks on behalf of more than two dozen conservative groups that claim their harassment at the hands of the nation's tax authority continued long past the White House's purported end date - and, for a number of them, continues still. Of the 27 organizations the ACLJ has represented to date, ten still have not received approval, two years after applying. Two others gave up. "Without question, the IRS misconduct of harassing and abusing our clients was still in high gear from May 2012 through May of this year. . . . To suggest this tactic ended a year ago is not only offensive, but it is simply inaccurate as well," Seculow told the publication. -- Albuquerque Tea Party. This group applied for tax-exempt 501(c)(4) status in December 2009. This particular status would exempt the group from corporate taxes but donations to the organization would not be tax deductible. Their application is still pending, NRO reported, "and the group received a letter from the IRS promising its status was 'currently being reviewed' just one month ago," in April. -- Linchpins of Liberty. This Tennessee-based, conservative-leadership development group initially applied for IRS tax-exempt status in January 2011. It's now been nearly two-and-a-half years and their application is still pending as well, NRO said. "...[T]he IRS sent its most recent dilatory letter on May 6 of this year, four days before the agency admitted its political targeting and a full year after the White House claimed the activity had ceased," the publication reported. 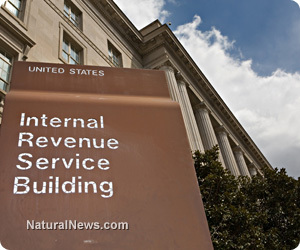 Sekulow's organization isn't the only one still battling the IRS's patently illegal behavior. True The Vote, a Texas non-profit group founded to train poll workers and to detect and report incidences of voter fraud (like getting local governments to take dead people off the voter registration rolls) has also filed suit against the tax collection agency. The group's founder, Catherine Engelbrecht, filed for tax-exempt status three years ago and she is still waiting for IRS approval. Her case is one of IRS hell. Because of her filing and because of her membership in the Houston-area tea party group King Street Patriots, her and her husband's small manufacturing business has been audited by the IRS and visited by a plethora of other government agencies like OSHA, the BATF and even the FBI. "The IRS would have everyone believe that 'all that was stopped in 2012.' That is not true," Cleta Mitchell, the attorney representing True the Vote, told NRO. "Many, many organizations' applications are still locked within the IRS." The White House line - which has been echoed by outgoing IRS Commissioner Steve Miller - that "the problems were resolved last year" is garbage. That statement "simply does not square with the facts," Sekulow said.